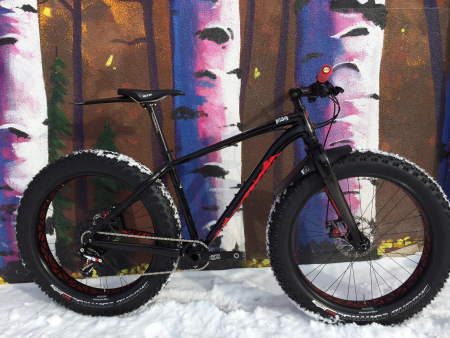 Peak Cycles Bicycle Shop is passionate about fat bikes in the winter months. They are fun and versatile bikes that can be used in almost any terrain but are particularly useful in snowy conditions. With the explosion of enthusiastic fat bike cyclists over the past couple of years, new fat bike companies and models have formed in a rush to meet the demand. But with all of these new fat bike brands, how do you choose which fat bike is best for you? If that isn’t exciting enough, Specialized has developed three different bikes including the Fatboy, Fatboy Expert, and the Fatboy Pro with front suspension. All three bikes share the M4 Premium Aluminum Frame and the Fatboy Expert and Fatboy Pro sport higher components such as Shimano Hydro Discs. While the Fatboy Pro offers more cushioned ride with its Bluto Suspension Fork and Sram’s XO1 rally sport package for a higher price, the other two bikes offer a solid build and smooth ride for lower budgets. For a lighter ride, you can opt for lighter bike parts and also purchase tubeless tires and carbon rims. All of which will make your FatBoy faster and more maneuverable. Join the Fat Bike rage! Demo a fat bike at Peak Cycles Bicycle Shop today or better yet – get your own! There’s a Specialized Fatboy, Medium in black and red on sale now! !